Hey everyone. I was tracking this and I was also very curious so I purchased the Hulk just to see. The buyer accepts returns and my plan was to have it assessed here in Boston. I did some internet research of course and saw another website in German that also calls out the Thor piece. Anyway, after I won I contacted the seller to follow up on shipping. Immediately the language of the reply was markedly different from the listing in grammar/syntax. So now I’m really curious. Shipping from Canada via the UK? I gave him a 5% benefit of the doubt because shipping over the holidays was absolutely insane, and I had a lot of other mail that was heavily delayed. A week later I get a call from UK customs. Was I expecting anything? I blanked for a moment and then remembered this piece and filled the guy in. He tells me that they’ve opened the mail because it was invoiced at $4 and it shipped from PAKISTAN. The was the customs guy was speaking, I could tell they thought it was a fake (IMO). I contacted the seller and told him the jig is up and please cancel and refund, which he did after asking me not to inform eBay. I received the refund today. PayPal name was Robert Lubber. I'd be suprised that a customs guy would determine the authenticity of a comic character sketch. (Mebbe he's a fan? Just seems unlikely.) The Pakistan part is interesting. The name Robert Lubber rings a bell, I think? if he did, you should report right away, he'll be shutdown. Plus they'll see him admitting it's a fake and asking you to not report it. Of course, he may just start a new account next week, eBay is really good like that. The name Robert Lubber rings a bell, I think? Robert "Bob" Lubbers (note the 's') was a terrific and, now, deceased comic strip/comic book artist. B. Lubber. Maybe the forger is The Blob? Yes everything through eBay messenger. He doesn't admit it's a fake. The customs guy didn't say it was a fake, but the questions he was asking definitely suggested that they had considered it. He did tell me "we do know this artist" (i.e. Jack Kirby). Their main issue was that the piece was invoiced at a value of $4. If it even shows up. The tracking number the guy sent me just shows it stuck in the UK. And certainly I'll have no incentive to pay anything in customs tax, so I'll refuse delivery if that's the case. I feel bad for the guy who read my posting of the Hulk piece and was "curious" enough to bid, so let me be really specific: this is a forgery. 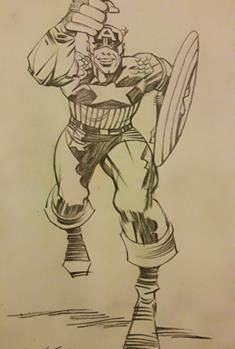 It's not by Jack Kirby. If you read this thread and then you bid on it, you're bidding on a forgery sold by a guy with a track record of selling forgeries. It's not a hidden treasure. The piece I was referring to in the above post is no longer on eBay, so I'm showing it below. Also the Hulk auction from p. 6 of this thread has vanished -- I'm not sure how that works, as it should be in the eBay archives, but it's not. Did you guys see all the stuff from the estate of 'Rob Lubber' up on the HA site for this Feb auction? Rest easy, I didn't bid after seeing your post. I found your post after the fact when I wanted to post about the whole experience. Will you be more specific? I took a quick look and didn't see anything. Never mind. I found them. Bob Lubbers not Rob Lubber. This is a forgery traced from the Daredevil -- excuse me -- D Man -- 1 cover. Oh, and this one, too, goes without saying right? Same auction house.